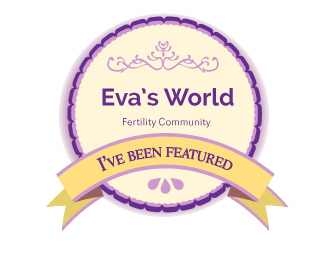 Through these links you can find more TTC stories as well as learn about another option for monitoring ovulation (Saliva Fertility Monitor). This kit can last years and sounds like a great alternative to having to purchase ovulation sticks every month! My name is Chrissy (I’m 41) and my husband’s name is Mike (he’s 44). The first time I became pregnant I was 38 years old. When I lost our baby at 15 weeks (2 days before my 39th birthday), there was no way to prepare for the devastation, trauma and grief. My second pregnancy was a result of an egg donor and we lost our twin girls at 9 weeks. The grief from pregnancy loss is at times unbearable and often feels like it is unrecoverable. When losing two pregnancies knowing that we rely on medical intervention to conceive, there is a constant fear that I may never become pregnant again. To manage the grief, disappointment, frustration and fear, I turned to writing as well as an online private support group. I have also participated in individual and couples therapy. I share my story with friends and family. I reach out for support. I seek out creative outlets and find joy in walking outdoors with my dog. I did not start blogging or participating in the online support group until much after my second loss. I wish I would have known about this sooner! This group has helped me immensely. Seeing other’s similar stories through the blogging community and social media has helped tremendously. Somehow through all of it, I just kept surviving. I just kept breathing. I gave myself space, I let myself slip into darkness, I let myself grieve and I felt all of it. Then step by step, I slowly came back. My world that looked muted and dark started to look colorful and beautiful again. I didn’t give up. I celebrate our babies’ short lives in small, private ways. I try to honor them in my writing and my husband and I remind each other that we will always be their mom and dad. The love for our babies never goes away. My story is a little different. Interestingly, I’ve never had the opportunity to try to conceive naturally. So there’s never been ovulation testing, or temperature monitoring or any kind of tracking on my part in a natural cycle. I’ve only tried to conceive with medical intervention where some of those cycles required ovulation testing to align with the IVF or embryo transfer cycle process. There are some additional challenges after 30 and I did not have the opportunity to start this process until 37. I did two rounds of IVF where my body was able to produce 4 healthy embryos. Compare this to one round of IVF from my egg donor who produced 31 healthy embryos at the age of 30! Over the past few years of going through this process, I continue to see a decline in my fertility. I gave up on my own body for IVF at the age of 39 as my second round of IVF only produced one healthy embryo. I’m now 41 years old and my menstrual cycle can be less predictable. I’ve had to transition from using a “natural cycle” for a frozen embryo transfer to only doing “controlled cycles” which means my cycle leading up to the transfer is controlled by hormone injections rather than being able to rely on my body’s natural cycle. For anyone trying to conceive naturally into their mid to late 30’s I recommend a healthy lifestyle, exercise, acupuncture, doing your own research on helpful vitamins/supplements and seeking out support from others who are TTC. Friends and family’s care can be huge pressure. What kind of stress have you had from them, what do you dislike the most and how do you hope people treat you? I find that there is a very different kind of support and/or pressure at this stage in my life (41 years old) vs. being in my 20’s or 30’s. I had a prior marriage and long term relationship through my 20’s and early 30’s where there was constant talk and questions from friends and family about the timing of starting a family. However, in that relationship we were not trying to have a baby (not my choice) so the questions were painful and frustrating and annoying. Trying to start a family in my late 30’s and into my 40’s is a whole different ball game. We don’t get those questions…Likely, assuming we are too old to try or don’t want to have kids this late in life. So, the external pressure to have a baby is gone. However, for the people who do know our struggle and care about us, there is solid support for the emotional side of it and the grief that we’ve endured through both of our losses. At our age, our friends have experienced some level of tragedy in their lives as well, so there’s a stronger ability to help a friend who is grieving. There’s also a level of friendship at this age where we just accept each other and support each other’s life choices. Whereas in our 20’s and early 30’s there may be more judgment or lack of understanding why we would take a certain path that may be outside of the “norm”. I think the question that scares me the most now and that I still hear after failed attempts is, “are you still going to try?” or “do you think you are going to give up?” These are questions I don’t want to answer. Hearing this makes my stomach turn into knots. I struggle with whether or not I should stay on this path every day and it is terrifying to think that this dream of ours may never come true. Overall, I think it’s important for people in our lives to respect the decisions we’ve made to try to build our family, offer sympathy in our grief and to say something rather than to pretend like our losses did not happen. Acknowledgement of the lives we lost and the parents we became while pregnant can be incredibly meaningful. I was desperate to find a way to get my sadness, fear, grief, frustration and misery out of me. All the therapy and talking about it or trying to just “let it go” was not a cure. I have a family member who is an avid blogger and I thought I should give it a shot. I started writing in secret. Too afraid to even tell my husband! I wrote for about 2 weeks before I told him what I was doing. I even say in my blog that when I started writing I wasn’t sure if I would be brave enough to share it with anybody. But I took a chance. It was a way to get all of this pain out of me without having to re-hash it verbally to anyone who asked. There are so many details of this journey that I couldn’t even say out loud because they were just too horrific and too painful. But I was able to write about it. So, this enabled me to share the entire, real, truthful, painful story and to get it all out of my head. I’ve found it incredibly therapeutic. The additional benefits are that I’ve developed connections with other bloggers experiencing the same things. Sometimes my thoughts seem so irrational when it comes to fears about pregnancy and the exhaustion with TTC over and over again. But then I read someone else’s blog and find that we feel the exact same way. Or I read someone’s blog who has been trying for so long, has had multiple losses and now they are experiencing a healthy pregnancy. That gives me hope. My blog has created connections for me with other people and that has helped me survive this pain. I hope that I’ve been able to help someone else with their pain too. Additionally, by writing and sharing my story, it’s slowly helping others talk about their own losses that they were perhaps too scared to talk about. It helped me have conversations with family members about our journey that would otherwise have been too difficult to have, or perhaps would have been avoided. It is always scary to open up about tragedy in life or the suffering we are enduring, but when we are brave enough to share, the love comes flooding in (and sometimes from where we least expect it). The journey of TTC is unpredictable, cannot be controlled and differs greatly from one individual to the next. Some people have unexplained infertility, some people know the exact reason quickly, some people are still trying to get an answer through test after test, and some are just left wondering, Why Me? We can be unexpectedly blessed with a beautiful, full term pregnancy that we thought was impossible. We might be lucky to finally get pregnant but then experience the tragedy of losing our baby. IVF might work on the first try or maybe not until the 8th try, or maybe not at all. Some people have the physical and mental stamina as well as an unbreakable relationship bond to keep trying for great lengths of time at great financial expense. Others determine quickly it is not the path for them after all because the pain of a repeat negative pregnancy test is too much to bare. This journey can make a marriage unbelievably strong or break it down and destroy it. This journey relies heavily on faith and hope and love and a support system to help you reach acceptance no matter where the journey takes you.